One of the most puzzling unsolved mysteries of the ancient world is the writing system of the Indus-valley civilisation.Though there are over 4200 inscriptions, on seals, tablets and pottery, the writing has not been decoded acceptable for every one. One of the problems is that the writing is too short mostly being four or five symbols long. The decipherment of Indus script (also known as the Harappan script) is also hard because the Indus writing falls into the most difficult category in the relation between script and language. While the easiest one is where the script and language are known, like English written using Roman alphabets, the most difficult one is where the script and language are unknown; the Indus writing falls into this category. seals must have been related to trading transactions and contain information about the traded goods (name, quality etc.) or the trading merchant (name, title, location, clan etc.). For example, The Mesopotamians, with whom the Indus cities had active trade, used seals for stamping sealings (i.e. seal impressions) on clay, resin or other materials that were attached to sacks of grains, jars or some other article of merchandise. 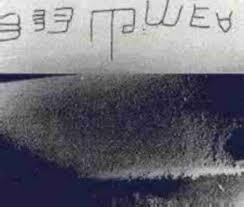 Recently, in 2012, a palm leaf manuscript also was discovered at a Harappan site in Afghanistan, containing seven lines of text, which is the longest script recovered from any Harappan site. The text remains undeciphered . In case of the Indus script, archaeologists had noted from a very early period that it is very similar to the Brahmi script, which forms the basis of all the subsequent scripts of India and South Asia. For example, When Sir John Marshall (the Director-General of the Archaeological Survey of India from 1902 to 1928) carried out the excavations in the 1920s that led to the discovery of Harappa and Mohenjo-Daro, he had compiled a big list of Brahmi characters that were derived from the Indus script. Also, In 1934, G.R. Hunter analyzed the Indus scripts in his doctoral dissertation and concluded that it was a precursor of the Brahmi script. The dominant scholarly opinion in India is also along the same lines. But when and how did the Indus script transform into the Brahmi? It is not clear, though, at exactly what point the Indus script transformed into the Brahmi script. In Northern India, the first inscriptions in the Brahmi script appear during the reign of the emperor Ashoka of the Maurya dynasty in the 3rd century BCE. Step by step the Ashokan Brahmi script evolved into the multiple scripts in use in Northern India today such as Devanagari, Sharada, Bengali-Assamese, Newari, Oriya etc. However ,In Southern India, there is evidence of writing using the Tamil-Brahmi script as early as the 5th or 6th century BCE even before the Ashokan Brahmi script. While most Indian scholars are in agreement that the Indus script was proto-Brahmi, there is much debate regarding the language being recorded using the script. Opinions are generally divided between Proto-Dravidian and Sanskrit, with many proposed decipherments. Recent findings, however, tilt the balance heavily in favor of Proto-Dravidian as being the language of the Indus seal inscriptions. Generally,Indus signs are Ideograms and Brahmi letters are phonetic in nature. BC by Iravatham Mahadevan and the Tamili insignia reads 'AM'. Inscribed Indus characters too should read 'AM'. [அம்].In Tamil 'AM' conveys several meanings.Such as :Beauty [அழகு ], Water [நீர் ], one of the tamil suffix [விகுதி], and so on . This pot shred was obtained from an urn burial site and there were two other urns with inscribed found in the same spot. Definition of water for AM is something that made us to think that this should have served as a pot for carrying water for dead. 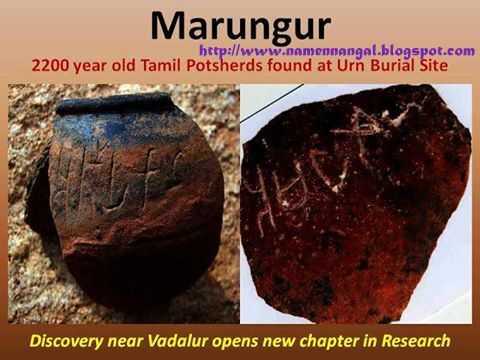 So,letters 'A' and 'MA' possibly descended from Indus sign 287 and 225 (of I.Mahavdevan’s sign list) as shown above? What ever correct,the basic truth is Brahmi script developed from Indus script. Comparison of Asokan Brahmi, Bhattiprolu and Tamili or thamil Brahmi 'MA' shows a slight of difference among them belonging to the same period. Mauryan Brahmi used for scripting Prakrit and Pali has a concave curve sitting on the head of a circle, Bhattiprolu is almost similar to sign 225 but looks like being turned about 90° to right. Tamili 'MA' though derived from sign 225, looks like a line partitioning a 'U' tube at the centre.